Byron’s Hot Dog Stand takes up a narrow storefront in downtown Elizabeth City. The hot dogs are a dollar each, even with chili, so I ordered four. I would have gone for more if I didn’t feel gluttonous, I think I could have held three in each hand, but pride gets the better of desire sometimes. As he rang me up, I asked Byron what gave him the idea for a hot dog stand. It seemed a throwback to another generation, a lost piece of history and I wanted to know why someone would open up a place like that. Running out of money, unemployed, kids, but he went for it. 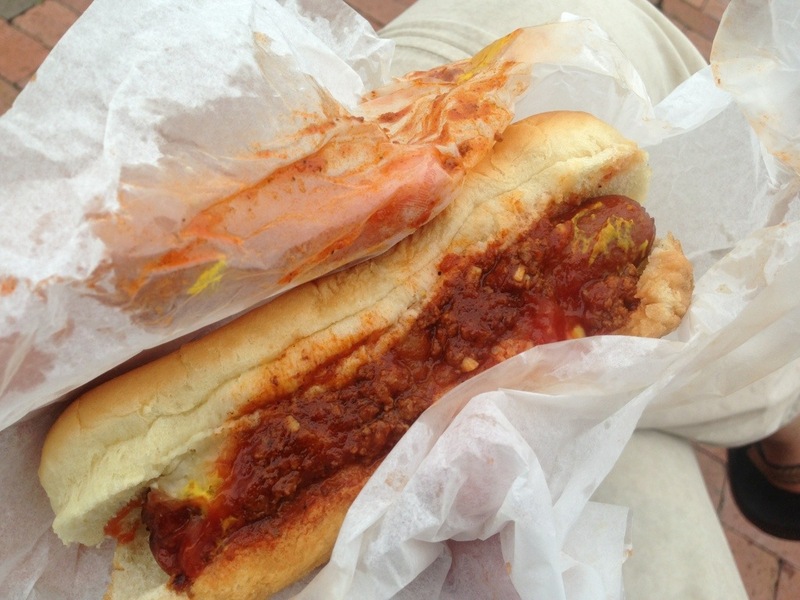 I paid and took my hotdogs down to the dock, thinking about how Byron must have felt when he flipped over that open sign for the first time, when the first stranger walked in and ordered a hot dog all the way (chili and everything), when he rang them up for the first dollar. Back in Miami, just a week after Key West, I helped my cousin Ali move tables for a party to launch Gorilla Wellfare, her new company. A while back, Ali wanted to workout at a dozen different boutique fitness studios–pilates, yoga, crossfit, that sort of thing–but only wanted to buy one membership. Of course that didn’t exist, so she created it–one membership, many gyms–and Gorilla Welfare was born. Or almost, we still had to move the tables for the party. “Yea, yea,” I said, laughing to myself that I was moving tables in the middle of a kayaking trip. We put the tables on an open patio, arranged chairs and centerpieces, decorated until everything looked perfect. Then she left to change and a Florida thunderstorm rolled over Miami from nowhere and dumped an inch of water in a few minutes. Every relative around came rushing outside to help. Aunts, moms, sisters, cousins, everyone scrambled to clean off tables, salvage decorations, dry chairs, mop the floor, anything to make that party happen because we all knew how hard Ali had worked. She’d had this idea, just a concept, and was fighting to bring it to life. In that moment, I didn’t care about the boat or where I would resupply on the East Coast or what equipment needed repairs. I only cared that she was so close to pulling her dream out of the air and making it real. I felt so proud of her that night, watching her talk about the company, seeing that smile I’ve grown up with throughout my life shine brighter than ever. It was her moment to flip the sign on the hotdog stand, to sit in a yellow kayak and point toward Key West. Everyone’s got an adventure. How it calls doesn’t matter. Only the answer is important. Is your stomach grumbling near Elizabeth City, NC? Check out Byron’s place and for goodness sake, go with the chili on the dogs. It’s sloppy, but delicious. Eating a bit too much at Byron’s and want to get back in shape? Gorilla Wellfare will get you into the best locally owned fitness studios in Miami. They also have a great blog that covers everything from health to fitness to inspiration for life. And if you see my cousin Ali, tell her Daniel says hi. Posted in Angle to Key WestTagged adventure, Angle to Key West, Byron's Hot Dog Stand, Elizabeth City, Gorilla Wellfare, miamiBookmark the permalink. I love how you blended Byron’s and Ali’s stories into your message. I am also amazed that you stopped at four!